There are some challenges that come with trying to translate 17th century primary sources into a digital humanities project. In previous posts, Chris Parsons has discussed the pedagogical background of this project as it has come to fruition, and Matt Bowser has written about some of the difficulties behind data mining and managing these sources. My participation for the project has been the georectifying and georeferencing of 17th century maps using ArcGIS, a platform of tools that allow for the inclusion and manipulation of spatial data and maps. Figure 1- Photograph courtesy of the Norman B Leventhal Map Center, Boston Public Library, Cartography by Herb Heidt and Eliza McClennen, Mapworks. 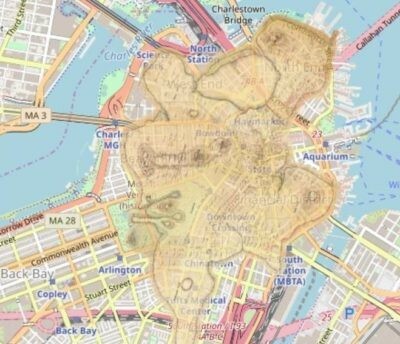 Some of the key challenges that comes with transfering a digital copy of an early modern map to a geographic information system is keeping the historical integrity of the map while also adjusting it to be geographically accurate against contemporary base-layers of the present day location (in this instance, I used a map of Boston in 2018 as the initial layer for the project on ArcGIS). In the case of this project, I was exposed to the reality of Boston’s geography when the 1648 Clough Map was laid onto the present day coordinates of Boston. The layout of the city I have lived in for years became a stranger to me when I discovered how drastically the land of Boston has changed. From the 18th century onwards, major landfill projects resulted in the flattening and expansion of Boston’s geography (See Images 1[left] and 2 [below]). When trying to georeference coastal points on the Clough map to the contemporary layers on ArcGIS, it was not as easy as lining up a point on the coast of the Clough map to the coast of the modern day map. 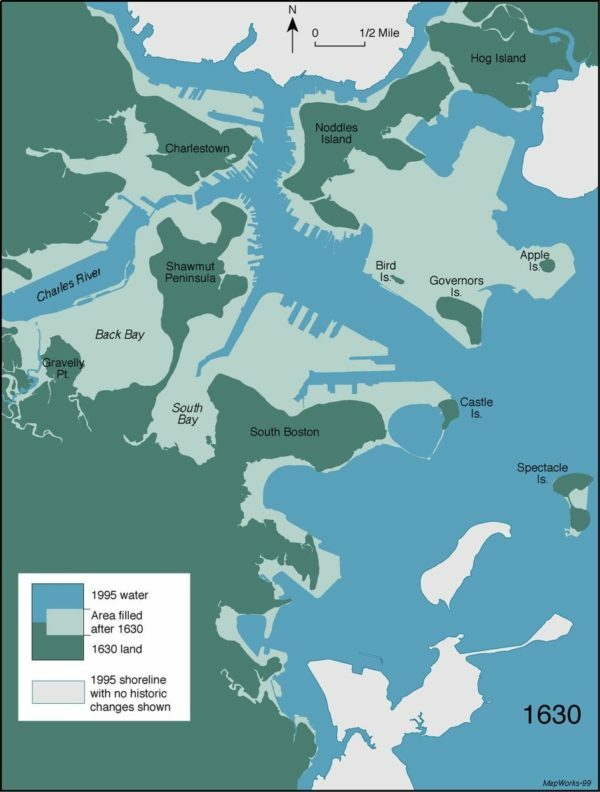 What was once the coast of the Shawmut Peninsula could now be a point in the present day financial district of the city. Much of my work for this project was struggling to find static land markers that show up on the Clough map and the current maps of Boston. As a historian of the early modern period, my mind immediately jumped to cemeteries and old churches, but in reality the best marker for situating the Clough map to present-day coordinates was the Boston Common. Little of the of the Common has changed since 1648, while some of the older churches were not formally constructed and marked on Clough’s cartograph. Cemeteries still exist from that period, but corners and boundaries fluctuated over the centuries as the city streets straightened and were paved. Image 2 – Overlay of 1648 Clough Map on current map of central Boston. Image courtesy of MapWarper.